This weekend I cleared my work as best I could, ignored everything else and showed up to Concordia to participate in GAMERella, a game jam for girls, first-time jammers, and first-time game-makers. You can read more about it here. Before the jam, Nick Kornek and I decided to pair up, then show up at the jam and invite one person who had never, ever made a game or done a jam into our team. We had an idea of what we wanted to do ahead of time, but we were also prepared to be flexible and hear new ideas. Another goal that I had was to make that person’s jam as welcoming and awesome as possible. Friday night, we found the third member of our team: Jana Sloan Van Geest. She was interested in game narrative and willing to work on our idea. Naturally, after I gave her a quick tutorial on how to use audacity, we had her do the sound design for the game. Luckily, it turned out that she was a natural! The sound for the game is great! 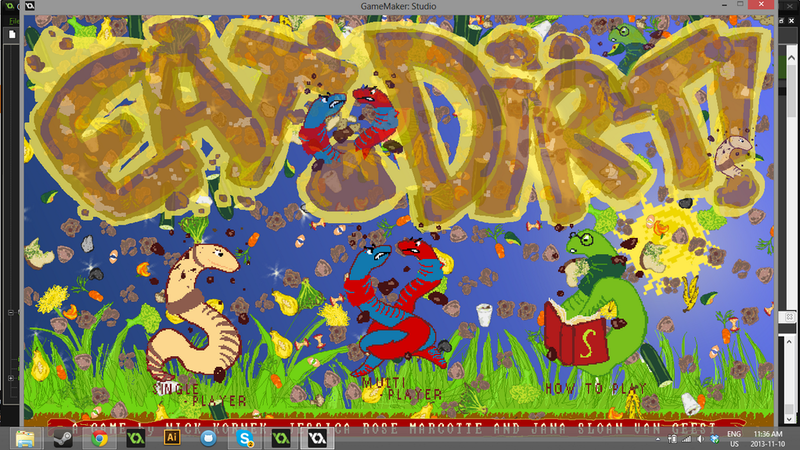 The resulting game, after 48 hours of work minus sleep, is called “Eat Dirt!” and I am extremely proud of what we were able to accomplish in just one weekend. Nick programmed it, I made the art assets, and Jana made the sound. This is the first time while working in a team that I have been solely responsible for all art assets. And then we waited… and I did homework and I don’t know what Nick did, probably work and homework…and then Friday came and it was time to jam. This game jam made me realize how far I’ve come as a gamemaker since I started in January, less than a year ago. This is the seventh game that I’ve made and I never realized how much knowledge I had acquired until it came time to impart it. I taught Jana how to use Audacity and very briefly showed her about Pyxel, the pixel art animation tool that I made all our art assets in. Jana used mostly sounds from FreeSound.Org as well as a tool called “Otomata” to create our sound and music. She took to it so naturally that, during the playtesting, people asking about the sound design. They would never have guessed that this was her first time doing sound design. I feel extremely happy to have helped someone through their first jam – Jana said she had a blast and it feels great to encourage new game creators the same way that I was encouraged during my first jam. The game creation went so smoothly that I hardly understand it. I would love to work with Jana and Nick again – and I will! We are looking to port the game for the Arcade Royal and create at least two new modes: “Two Worms, One Compost” and “4-player Coop Versus” (two worms to a composter, cooperatively eating against two other worms in another composter). We’re putting the game jam version up online (here’s a link) but we may eventually distribute this as a full-fledged indie game. My recommendation is to plug your computer or laptop up to a TV using a HDMI cable, get a USB keyboard, and have one person play on the laptop keyboard and one on the USB keyboard. At TAG, we were lucky enough to be able to project the game onto the wall and have two USB keyboards to hook up to my computer. The Playtesting for this game was some of the most energetic that I’ve ever experienced as a gamemaker. The cherry on the sundae (and the Sunday, since that was when the playtesting happened) was Nick’s e-sport commentary. It was hilarious, energetic, and really made the game come alive. I’m going to suggest an “e-sport commentary track” which can be toggled on or off. Actually, “Eat Dirt!” went so well that it took top honours during the judging! – Nine playable games got made. – The ratio of men to women was almost fifty-fifty (this is unheard-of in game-making). – According to informal polling, one-third of people at the Jam were making their first game. P.S: if you are a woman who would like to make her first game but isn’t sure how, the Pixelles Incubator II is now accepting applications. Or, contact TAG or myself and we’d be happy to point you towards some great resources. ← Vanier College Symposium talk – Video Games: A New Literary Genre?